A sporty looking, mountain bike-style, hardtail e-bike built for distance and everyday use? That is what the Haibike Sduro Trekking has been built to deliver. Despite being fairly new to electric bikes, I simply had to call one in and put it through its paces. As such, what follows is as much a review of electric bikes in general as it is the Haibike Sduro (also sometimes styled SDuro, sDuro or SDURO) specifically. The Sduro Trekking is available to buy now from Haibike, and is available in a range of models and sizes. Prices start from £2,249. The first thing I noticed I when going hands on with the Haibike Sduro Trekking was just how substantial a unit it is. There is a very solid, future-industrial air about the machine, which radiates from its robust frame to its Yamaha PW Motor Unit and on to substantial front suspension and pannier rack, the latter a definite boon for me as I tend to transport quite a lot of tech with me most days. The battery itself is also substantial. A 400wh Lithium Ion battery that resembles one of those handheld cordless vacuums and affixes to the central frame directly above the bike's motor unit and pedals. The action to get the battery into and out of its holster on the Sduro Trekking threw me at first, as it has to first be unlocked by key (sensible; easy to achieve) but then before it can be lifted out of its contact point it needs to be slid to the side slightly, which at first I achieved at the expense of grazing my knuckles quite painfully on the top of the battery holster. I did get more accomplished at removing and inserting the battery, mind, and it comes with a useful carrying handle for transportation into your home or office for charging, which takes but a few hours for a full charge. Rounding off the modern look is the bike's clip-on LCD screen, which slides in and out of a bracket mounted on the handle bars, and front mounted, battery connected AXA lights. I also dug the SKS Chromoplastic Mudguards and shock-resistant Skidplate, which protects the bottom side of the electric motor from impacts from gravel and stones, which on Bath's cycle routes and towpaths was definitely appreciated. Overall, I came away from the Sduro Trekking with the opinion that it looks like a hybrid, which as a bike that is pitched as a tourer that you can use everyday, as well as one that you can use both on and off-road thanks to its sturdy mountain bike-like build and fat tyres, it very much is. The styling was spot on in my mind, too, and I am definitely a sucker for the diagonally-aligned, cross battery and frame "Haibike" logo positioning. That Yamaha PW Motor Unit nestles between the Sduro's pedals and is impressively compact. It delivers assistance in a variety of power levels, from Eco, through Eco+, Standard, and onto High. That equates to a flat-friendly 50 per cent on the lowest setting, right up to a hill-crushing 280 per cent assistance at the top. This was my personal favourite, I must say. The mode is selected via the LCD screen, which also displays key information such as battery life (the 400wh Lithium Ion battery is rated to deliver up to 80 miles of assisted juice), speed, assistance level, and distance travelled. Once the mode is selected, the Sduro supplies pedalling assistance based on the gear selected, pedal rotation speed, and overall speed. As with all electric bikes, there's a speed limit to this assisted pedalling, with the motor granting nothing over an EU-mandated 25kph – which is about 15.5mph. Depending on how quick you usually ride a bike this will either be a frustration or a moot point. If you regularly get up to 20mph, the way that the motor cuts out at about 15.5 means it feels like the bike is 'fighting back' if you try to go faster – that's down to the sheer weight of the thing. If, however, your favoured speed of progression is no more than 15.5mph then you're golden. Because of the way the bike decides when and how much to assist you, I also found myself trying to 'game' the bike to minimise my own input, especially on hills. If I tried to gun it too much, the bike's computer would make the decision for me that I didn't require assistance and all of a sudden I'd be trying to propel a very heavy bike with my legs alone. However, by maintaining a lower level of pedal rotation, in a specific set of gears, the motor would never drop off. Getting and keeping that sweet spot turned into a fun game at times. That's not really a negative point, just an illustration of how different ebikes such as this are to unpowered cycles. You have to surrender some control to the system, and accept its limits in terms of assistance speed. I'm guessing the vast majority of riders who pick one of these up will be using them as commuting and touring cruisers, anyway, and be quite content to remain at a slow to moderate speed. Overall, I found the Sduro Trekking to be a very slick experience, and a very comfortable one, too, courtesy of the plush tyres and front suspension forks with 63mm of travel. This really helped minimise smooth the ride, especially when riding off-tarmac. Indeed, the high levels of comfort, premium build quality and sturdiness, and slickness of the gear system really made journeys – especially longer ones – a pleasure. Motor assist took the pain out of the steepest hills so I could sit back, admire the scenery, and cruise by sweating MAMILS with minimal effort. That's definitely an experience I could get used to. Battery life also impressed, with a single charge of the Sduro's hulking power pack giving me about five days worth of commuting action, which involved a 15-20 minute ride in and out of work each day, on a route that takes in a fairly substantial hill. The Sduro Trekking's battery also only required a couple of hours in its charger to hit 100 per cent again. For me, as a casual cycle rider, using an unpowered bicycle to get to work is basically written off, as while I can freewheel down into town in the mornings, I simply don't want to have to power up the long, steep hill back in the evening – it takes ages, and I'm not in the mood after a day at work. With the Haibike Sduro Trekking this problem was eradicated, with a quick shift of the bike into High assistance mode allowing me to crunch the hill climb and arrive back at my house having experienced a workout, but not painfully broken and cursing profusely. 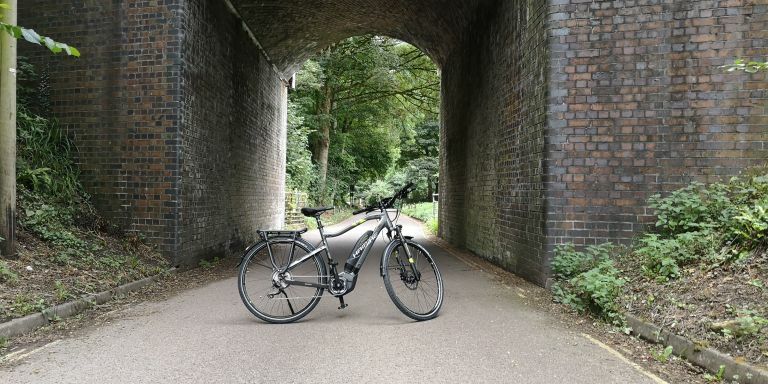 I was also impressed with how well it handled itself when taken off road, with its industrial frame and chunky tires allowing me to take on Bath's gravel-filled canal towpaths, as well as various dirt tracks and open fields. You can't say the Haibike sDuro Trekking is light and sporty, but it certainly is versatile and grants you the confidence to go pretty much anywhere. As noted, what I didn't like was the noticeable, sharp drop off of the electric motor when hitting the law-mandated speed limit for these bikes. This makes it really quite difficult to push on to 20mph and beyond, unless you're flying down hill or have the thigh muscles of Dolph Lundgren. On the bike sent in for review there were also a few incidences of chain slippage between gears every now and then, with the missed-beat, slide-clunk particularly annoying when travelling up hill. This is easy enough to fix but annoying and also surprising considering the typically German attention to build quality evidenced everywhere else on the bike. Overall, there's no doubting the quality of the Haibike Sduro Trekking. If you live in a city with few hills, it's totally over-specced. But for commutes that take in more rural, hilly areas, or for going off road and onto woodland trails and the like, it's great.